For the first time, The Lost Tribe of Coney Island unearths the incredible true story of the Igorrotes, a group of “headhunting, dog eating” tribespeople brought to America from the Philippines by the opportunistic showman Truman K. Hunt. At Luna Park, the g-string-clad Filipinos performed native dances and rituals before a wide-eyed public in a mocked-up tribal village. Millions of Americans flocked to see the tribespeople slaughter live dogs for their daily canine feasts and to hear thrilling tales of headhunting. The Igorrotes became a national sensation—they were written up in newspaper headlines, portrayed in cartoons, and even featured in advertising jingles, all fueled by Truman’s brilliant publicity stunts. By the end of the summer season, the Igorrote show had made Truman a rich man. But his genius had a dark side and soon he would be on the run across America with the tribe in tow, pursued by ex-wives, creditors, Pinkerton detectives, and the tireless agents of American justice. 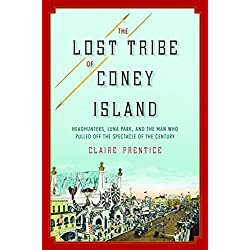 At its heart, The Lost Tribe of Coney Island is a tale of what happens when two cultures collide in the pursuit of money, adventure, and the American Dream. It is a story that makes us question who is civilized and who is savage.